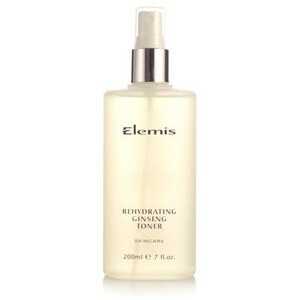 I got the opportunity to try the Elemis Rehydrating Rosepetal Cleanser and Ginseng Toner that are available on QVC. 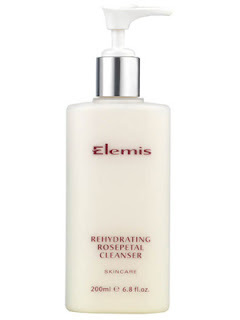 At the heart of Winter, anything that has the word "rehydrating" in it sounds pretty good so I was very happy to give those products a chance, even more so as Elemis is being raved about on the blogosphere. Rehydrating Rosepetal Cleanser : what the brand says. 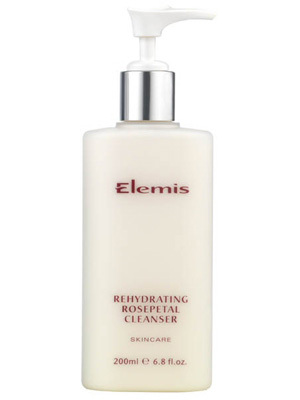 Elemis cleansers use natural bases and pure plant extracts, including lecithin, to gently and effectively melt away make-up and daily grime. The rehydrating rosepetal cleanser replenish moisture whilst cleansing with extracts of rose, vitamin E and F.
This cleanser is actually a milk, and you are instructed to massage it into the skin like you would with for example, an oil, then wipe away with a cotton pad. You could also use a hot cloth to remove it, but that is not always recommended for dehydrated skins as very warm water can distress it even more. The milk is very soft and soothing, and smells of rose but not in an agressive or artificial way - which is good as I am generally not a fan of rose smells. Very good point: it does remove my eye makeup, including industrial strength gel liner (I don't use waterproof mascara though) and it doesn't sting the eyes at all. The bad point: when I wear a heavy base this doesn't remove everything. I'll wipe my face with a toner afterwards and will find remaining makeup on the cotton pad. So I wouldn't recommend using it as your sole cleanser to get rid of a full face. All in all I think this is an excellent product for very dehydrated, dry or mature skin, that is best kept for morning cleansing or when you are wearing lighter makeup. You can of course use this with heavier makeup if you follow up with another type of cleanser (foaming, oil...). Rehydrating Ginseng Toner: what the brand says. Elemis toners are alcohol free and designed to rebalance the skin’s PH level, lift away traces of cleanser and gently tighten pores. The Rehydrating ginseng toner tones and clarify the skin with ginseng and sweet betty flower. If you are familiar with my skincare routine, you'll know that I mostly use toners in the morning, instead of a cleanser, to wipe away the night. This one fits the purpose very well: it has a fresh invigorating smell, isn't sticky nor stingy. You can absolutely use it for a 3 mins lotion mask to leave your skin rehydrated and plumped. All in all a very good toner that does its job perfectly. If you like a good deal, you can currently buy a set with both products (full size cleanser with a smaller sized toner) for £20 on here! More skincare offers on here. Products were provided for free for review consideration, this review reflects my true opinion on the products and I wasn't offered any compensation to write it. Tehre is so much to try in this range it's hard to decide where to start indeed :) But they have quite a few kits with travel sizes that are great value for money and allow you to try several products.